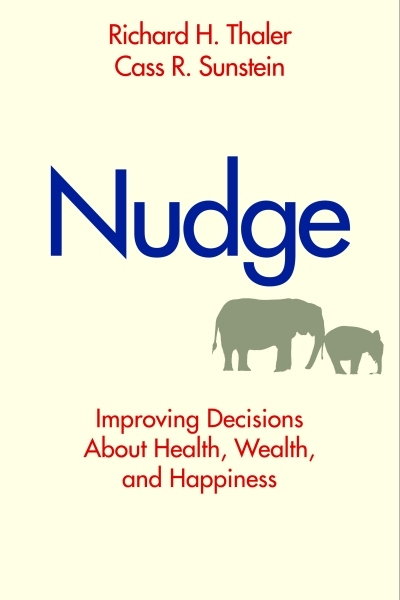 I’m reading an interesting book called Nudge—Improving Decisions about Health, Wealth, and Happiness. It is by Cass Sunstein, a law professor at Harvard, and Richard Thaler, a behavioral economics professor at Chicago. This book summarizes the social science research that has identified the recurring ways in which people make decisions that are not necessarily good or in their best interest. The premise of the book is that you can nudge people to make better decisions by changing the context in which they make those decisions. The book is much more interesting than I just made it sound. Understanding the circumstances in which people make bad decisions gives us the potential as “choice architects” to nudge them in directions that can improve their lives in significant ways. Questions about irrational decision making have become popular. Another best-selling book, Predictably Irrational by Daniel Ariely, a behavioral economist at Duke, addresses many of the same questions raised by Nudge. I have not read Ariely’s book, but I have watched his interesting presentation at a TED Conference about the ways in which we all make irrational decisions. I want to finish the book and think about how it might affect our work. Can we do things that will nudge public officials to make better choices about how to work with the School? Can we help them design public policy that nudges people toward complying with the interests reflected by the policy? If we have a better understanding about how people make decisions, we should be able to serve them better. Let me know if you’ve read either of these books and your reactions, or if you have thoughts about this general subject. 1. To really test this out, we might want to “try it out on ourselves” — namely, what are some patterns that are not efficient, or fair, at the SOG and how can we frame choices that are more rational, just, productive, etc.? 2. I hope you’ll have a lunch brown bag on one or more of the questions you raise. 3. This seems relevant to the Collaborative Teaching Committee you have formed. 5. Remember that “choice architects” can easily be a buzz word for good old fashioned manipulation of preferences/choices, already well documented in the psychology of advertising.